In May 1944 Wing Commander Roland ‘Bee’ Beamont led three squadrons of Hawker Tempests into operations for the first time. Flying from RAF Newchurch in Kent, one of the advanced landing grounds constructed in preparation for the invasion of France, they formed 150 Wing RAF. The far-sighted Beamont had almost single- handedly overseen the transformation of the Hawker Typhoon into the most potent ground attack aircraft of its day before turning his attention to its successor – the Tempest. With thinner wings, greater range, improved ailerons, a redesigned windscreen and all-round ‘rear vision’ canopy it was a significant improvement on the Typhoon. Through the last year of the war the unwavering pilots who flew these two mighty aircraft became the scourge of the German Army, blasting their way through armoured formations, destroying airfields, shipping, barges, bridges, trains, marshalling yards, rail hubs, anything to support the advancing British and Canadian armies as they battled their way through Belgium and the Netherlands towards the Rhine. And, as an increasingly desperate enemy fought back with V-1 ‘Doodlebug’ flying bombs, the Typhoon and Tempest pilots destroyed those too – 150 Wing alone accounting for 638 V-1s destroyed. As the remnants of Hitler’s once-fabled army collapsed under the onslaught, many high-ranking Nazis were faced with a choice – go down fighting or cut and run. Many chose to run, heading north to the Baltic coast with one aim in mind – a last-chance passage to neutral Sweden. The Tempest pilots of 150 Wing, graphically portrayed in Robert Taylor’s painting, were amongst those tasked with stopping their escape. Once again the world’s most collected aviation artist has produced an astounding work that is set to become the defining image of the Hawker Tempest. Some of the greatest pilots of the RAF flew this iconic aircraft and Robert has depicted the final combat of the war for one such pilot – the legendary fighter Ace Pierre Clostermann. A Flight Commander with 3 Squadron, Clostermann is at the controls of his distinctive Tempest ‘Le Grand Charles’ during a strafing raid against the heavily-defended seaplane base at Grossenbrode, on the coast to the north of Lübeck. Having just destroyed two Dornier Do18 flying boats on the water, he now helps finish off a Bf109 and a Fw190 that have tried to pounce from above. 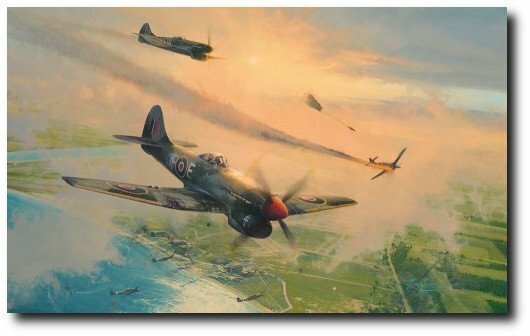 With the prints signed by distinguished veterans who flew Typhoons and Tempests in combat during World War II, this historic release will become highly prized by aviation art collectors and history enthusiasts everywhere. With all the signatures of the Victory in Europe Edition, each print is issued with a unique pencil drawing exclusively created by Robert Taylor. Individually signed by two of the foremost Aces and fighter leaders of the war, each drawing is conservation matted to include the original autographs of two of the most famous names to fly the Tempest. Tempest pilot on D-Day as Operations Officer for the 2nd Tactical Air Force. He finished the war as one of the RAF’s most respected leaders with at least 17 victories. Commanded 20 Wing, part of the 2nd Tactical Air Force on Typhoons. One of the foremost Allied Aces of WWII he finished the war officially credited with 24 ½ victories. Famous French flying Ace depicted in Robert’s superb painting THE FINAL SHOW. He flew Spitfires and Tempests and finished the war having flow 432 sorties, scoring 19 aerial victories plus countless armoured vehicles, trains and boats. Influential in the development of the Typhoon and Tempest, he flew both until being shot down in late 1944 and spent time as a PoW. He was an Ace with 6 aerial victories and the first V-1 ‘Ace’.